Outside the window of my breakfast nook, the roses have finished their spring bloom. A dream lingers in my groggy brain; a long-forgotten face floated upward in my sleeping subconscious. I have to close my eyes to reclaim it. I have forgotten his name but I know well the circumstances of his departure from my life. He turned his back on me because he thought I had betrayed him by unwittingly befriending someone whom he despised. I sip coffee and wonder how this old hurt arose from its murky muddy dungeon. Yesterday I went to KU for my third session with a neurological physical therapist. I got the times confused and arrived a half hour early. The lady at the desk, who speaks in sharp tones to everyone, grudgingly conceded that I had an 8:30 appointment and that I could find coffee in the cafeteria. I thanked her over-warmly but she had already turned back to the computer screen and did not hear. I felt glad for her ignorance. I heard the tinges of sarcasm in my voice even if she did not. I found the coffee and a fresh fruit bar. I fell upon the unexpected boon like a ravenous vegetarian hyena. I stood before the cashier holding an overflowing Styrofoam bowl filled with blueberries, grapes and cantaloupe. She laughed and added a penny from her bowl to my tendered cash. Then I moved towards a table, clutching the bowl in one hand and a large coffee in the other. The clock crawled towards 8:20. I calculated that the walk back to the Spine Center could take as much as ten minutes, and set out, still holding the coffee, in plenty of time. But at the cafeteria's exit the shaky cup spewed coffee and I stopped, disconcerted. Two women wearing scrubs and name tags skirted around me; one looked back. I don't know what she saw on my face but she took a step to reverse her progress and looked again. She drew her gaze to the cup, to the floor, just as I took a tottering step away from the spilled coffee and gauged the odds of getting something to clean it without further spillage. Let me help, the woman called back to me. Do you need a napkin? My voice failed me. She entered the cafeteria and exited with a handful of paper toweling. I could only murmur something low and guttural that could have been thanks. My vocal cords had stiffened. In the doorway to the Spine Center I stopped to steady myself. I took a slug of cooling coffee and continued onward. As I passed the counter, a different Admissions lady stepped out from behind the barricade and called a man's name. Across the room, a stocky gentleman, three-pronged cane in one hand, a sheaf of X-Rays in their telltale sleeves in the other, started forward. He had not taken three steps when the X-Rays spewed from his grip and fluttered to the ground. I paused and glanced over at the Admissions lady. She grunted and leaned against the counter, rolling her eyes. He might need help, I said. She drew her eyebrows together, turned on her heel, and went back to her desk. At that moment, another patient rose and gathered the man's X-Rays. She neatened the stack, and guided the man's empty hand to the bundle, pressing his fingers closed. She held the handle of his cane and helped him steady his stocky frame. Then he proceeded forward, more slowly, less certain. The woman and I stood watching until he reached the chair into which he lowered himself, in front of the clerk who had summoned him. That was nice of you, I said to the woman. She shrugged and smiled. I continued my journey to the chair closest to the door from which I knew my therapist would beckon me. Now the morning continues to unfold but I give myself to the lingering dream. My accuser's face rises, still cast in shadows. I recall though the outlines of his body -- the set of his shoulders, the sturdiness of his wrestler's legs. I think again of the man at KU, holding those X-Rays, leaning on that cane. Something familiar. A movement; a body type; a gesture. I pour myself a cup of coffee. I gaze out of my window at the rose trellis and its fading blooms, brown now, dripping with the gentle cleansing rain. I drink my coffee and sit, letting the day ease itself around me. With a mellow cup of coffee beside me and a piece of buttered toast in my hand, I gaze out of the living room window at the street and the houses which flank it. This view satisfies my craving for belonging, as it has done for twenty-two years. I realize that the neighborhood in which I live resembles that in which I spent my childhood. Small, well-kept front yards; bungalows and ranches; wooden porches, old trees, and the occasional passerby -- casually dressed, perhaps with a dog, maybe a child. I fit here; I belong. It neither challenges nor judges, my part of Brookside. The property values raise with each stoplight one travels westerly, but still I tarry, here on the eastern edge, near the city streets but not of them. This morning, one of my neighbors sent a message on social media asking for prayers for her mother-in-law, Clara Black. Mrs. Black lives a few houses north of me, in a house much like mine. She raised her son in that house. That son raised his own child in the house across from me. I can't imagine Holmes Street without Clara Black and yet, I know, if I am sixty she must be eighty. I do not wish for her to suffer and I will, indeed, lend my prayers to those of others. In this moment, though, Mrs. Black symbolizes the fullness of time, the turning of the season, my world changing but remaining the same: sidewalks waiting for different feet, houses opening for new tenants, trees yielding piles of leaves for toddlers who will some day rake other leaves from the same tree into piles for their own eager children. As I lay nearly sleeping before the sun rose, memories crowded me. People who have faded from my consciousness returned. I could see the curve of cheeks that have pressed against mine; the light in eyes that no longer shine or that shine in other cities, in other mirrors, beholding others and leaving me unseen. Children who now sit at desks crunching numbers tossed jacks on sidewalks as I drowsed. In twilight sleep, my brother Mark dared me to jump from the treehouse and my body left the warmth of my comforter to plunge ten feet and thud against the summer ground. I wrapped my arms around myself to reclaim sleep, groggy, sucked down by the quicksand of memory. My mother stands on the neighbor's lawn under the platform from which I have jumped. She shakes a finger at my unrepentent brother. With her other hand she grips my shoulder. Why on earth did you jump out of the treehouse? she demands, and the reply echoes in my aging mind: Because Mark told me to. At sixty, I still understand: It is not for a sister to think, when her brother tells her to act. I lift my arm from under the covers, here in Brookside, fifty years later. I flex the fingers, bend the elbow, freeing my muscles from the memory of that insult. And my aging heart, with its SVT, beats rapidly. Warmth rises to my cheeks where once before it rose, seeing the smirk on my brother's face, a flicker of amusement where I longed to see approval. In an hour or two, I'll travel eastward and by noon, I'll be surrounded by the people that my brothers and sisters have become, our perfect balance -- four boys, four girls -- destroyed by the loss of one but augmented by another generation. I will stand among them as I have always done: barely speaking, slightly smiling, sure that the fluttering in my chest betrays me. I will cross my brother's kitchen to pour a cup of coffee, and someone will ask if my son is coming to the big reunion tomorrow. I will smile and murmur something vague, my words falling into the brief ripple just before it closes, leaving me to lean against the counter while my family ebbs and flows around me. Outside my window, the laden rose trellis signals that the world has turned again. The men who now live in the house which the trellis climbs have tended it well and this year's blooms show the reward of their care. I benefit from their ministrations. The heady fragrance wafts through my open backdoor reduced by the distance to a pleasant scent. I gaze on the vine from my breakfast nook, vibrant colors, curling petals, plush greenery. My mailbox yielded pleasantries last evening when I finally returned home from a full day of work and an evening with the effervescent Vivian Leahy and the lively Jennifer Rosen. I can barely keep pace with some of my women friends. Their eyes spark with the fire of their thoughts; their smiles radiate throughout any room they occupy. I'm tired but happy when I spend time with them. Friday was no exception. But the mailbox: a Mother's Day card from my son Patrick, with a sweet message and a snippet of The Journal, a quote that I well remember from the days when my mother introduced me to On Walden Pond and other writings from this most wondrous author. As I read what my son has written, and the printed message on the inside of the card which he chose for me, I am suddenly drawn back to a time before he came, before I understood the purity of maternal love. I'm lying on an examining table. It's April 1991, and I've driven over the Pig Trail from Fayetteville to Little Rock. I've already seen the folks in the Pediatric Infectious Disease Clinic who've made me part of a study; I've submitted to the torture of the lady in Orthopedics who strives to keep me ambulatory without the medicine that I've had to discontinue using. Now I'm about to have a humongous needle stuck into my enormous belly for purposes of extracting some of the fluid which surrounds the baby inside me. I've already prepared a nursery in the apartment to which I moved in town. I don't like pink and I'm so convinced that the child is a girl that I avoided blue. I chose, instead, pale yellows and delicate greens. But the name which awaits this child signifies my certainty of its gender. She will be "Elizabeth Lucille Johanna Corley". My sister Joyce's middle name is "Elizabeth" and my mother was "Lucille Johanna". The "Johanna" comes from my maternal grandmother. I think this name will suit my child and pays tribute to three major influences in my life. In early February, I lost this baby's twin; so I am taking extra care to be sure that Beth --- as I intend to call her -- survives. So I am on this hard surface with its crinkly paper to get amniocentesis. My due date is August 21st, a day of which I'm not overly fond as it is the day on which my mother died. But there's a certain symbiosis with the coincidence. I'm at about eighteen weeks gestation, the very earliest they would do the testing especially since I've already miscarried one child. I'm in the room alone. I've no partner, though a secretary from my office drove me to Little Rock and waits somewhere in the outer edges of the vast medical facility. My baby's father walked away from the chance at parenthood. So I'm going through this with the tangential help of the village which awaits the child whom they plan to nurture, ready-made aunts and uncles since I'm living far from those who bear the title by blood. I'm lucky: Though my nights might be lonely, and the fears many, I've a score of adults eager to babysit. A woman comes into the room. She wears a white lab coat. She pulls a rolling stool and a monitor towards the examining table and settles herself. She lifts the sheet which covers me and smears something cold and sticky on my belly. She smiles. "Do you want to know the gender of this baby?" she asks. I tell her that I do not, that I would rather wait until birth and be surprised. She holds a wand to my skin and moves it around, gazing at the monitor and then she gasps and says, "Oh, you're having a boy! See, it's a boy!" And I think: What part of "No, I do not" was unclear? But my mouth betrays me more deeply by blurting out, "What in God's name am I going to do with a boy?" The woman stops her work and stares at me in mild horror. I hold her gaze for a moment, then turn to face the wall. I feel the pressure of her equipment again, and then the door opens and a gruff man enters, also clad in white. He does the test, though he has to stick me twice since I jump the first time, for which he blames me in a tired voice. And then the test is over and I am left to dress and make my way back to Sendie, the friend who has driven me. I don't tell her the news. I'm still digesting it. I'm still trying to figure out who will teach him to throw a baseball, change the oil in a car, pee standing up, and all those things that a father would instinctively know and share. I'm still holding fast to my Elizabeth, whom I was sure I bore. I'm wondering what I will call this child since "Beth" will no longer suffice. The child got born, though early. He entered laughing. He went without a name for two weeks until I finally grew tired of calling him "Bundle", after "Bundle of Joy", a nick-name which morphed into "Buddy", an appellation which my son bore until kindergarten. Instead, I named him after two influential men in my life: my brother, Stephen Patrick Corley; and my best friend, Charles Alan White. My baby became "Patrick Charles Corley", a name that he has sometimes loathed but to which he has, hopefully, become resigned. The other day, my son called and asked what might be amiss to cause his turn signal to cease working. I speculated that it could be a burned-out bulb or a fuse. He said, "Am I the only person that doesn't know these things?" and though his question might have been light-hearted, my stomach flopped. I realized, as we ended the call, that there had been a whole host of things that I never taught my son -- things at which I am not all that accomplished, and which in my mind must have been a father's province. But here he is, an adult, and he has survived being a fatherless child. I hope he understands my choice to bring him into a single-parent home. I suffered substantial criticism for my decision, dire predictions of disaster, well-intended advice to give him to a "real" family. But I had waited long to be a parent and even though the nausea which I felt on learning that I'd be the mother of a boychild never really left me, I have no regrets. He's a good son, and a fine young man. His path has taken him over some rocky roads but he keeps walking, just as my own mother encouraged me to do. And how can a mother not love a son who quotes Thoreau in her Mother's Day card? "When I see the dead stems rising above the snow by the roadside, sometimes in dense masses, which carry me back in imagination to their summer life, I put faintly a question which I do not yet hear answered: why stand they here? Why should the corn-stalks occupy the field longer than the green and living did?" We all know that tomorrow is Mother's Day. I gave some thought to spending a few moments educating myself on the origins of this annual commemoration of procreation. But then again, I don't really need to know why we honor our mothers only once a year. At least we do that. And inevitably, in the coolness of this morning when I stood out on my porch surrounded by blooms, I thought of my mother and missed her for the millionth time. I scrounged around the house trying to find a picture of my mother to include in my Musings today. I pulled boxes out from the backs of closets and down from shelves too high for me to reach without climbing. I finally resorted to a photo album that my sister and niece created one year. I stare at the photo before putting it on the scanner. 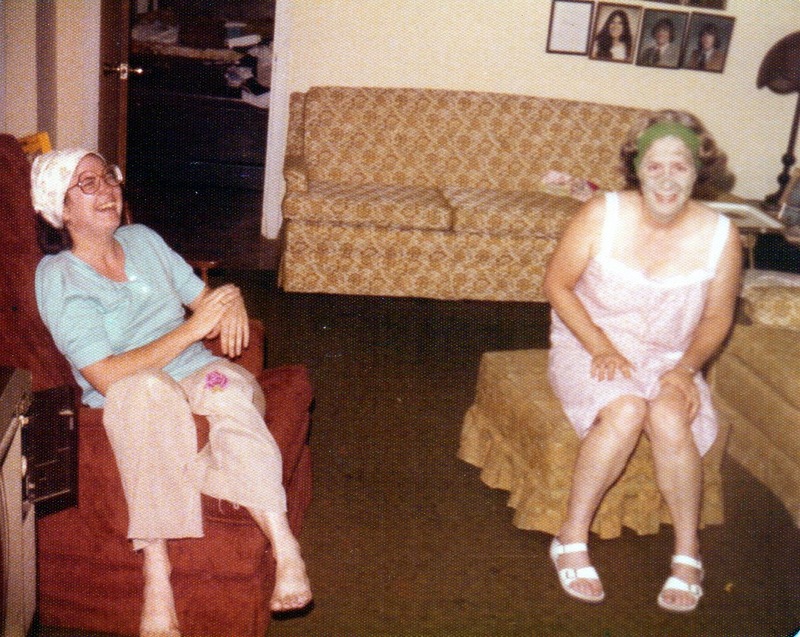 In this picture, my mother has some frou-frou product smeared on her skin. In the mid-seventies, my mother went through a period when her face hurt every time she got anxious. To alleviate that sensation, I would give her facials. And the process worked -- not because facials ease tension, but because my mother felt so ridiculous that she would howl with laughter. My family had some rough years, but I remember laughing with my mother so many times. It's a good picture. It represents us. I'm a terrible poet and a passable essayist. I've written a lot about my mother over the years and I often quote her, sometimes attributing things to her that I'm not really sure she said. But my mother permeates every thread of my being. I have her frame, her hair, her eyebrows. I have her dogged determination which some characterize as relentlessness. I hope I have her ferocious protectiveness of weaker beings. Her love of cool mornings, hot tea, pretty flowers and Willie Nelson certainly survive in me. In my mother's last months and weeks, I sat beside the hospital bed in her room at home on weekends, having made the trip from Kansas City after court each Friday. I would put "Always On My Mind" on the turntable over and over, followed by the New World Symphony. One Sunday we watched Terms of Endearment, not realizing that the main character would die of cancer, leaving her children in the care of their odd grandmother. We looked at each other and raised our eyebrows. "Maybe not the best choice," my mother admitted. Then we laughed and the mood lightened. My mother supported my dreams, though she often tried to steer me down practical avenues. She dissuaded me from taking dance lessons but enrolled me in tumbling classes.When I proposed spending a year in France during college, she mildly pointed out the implausible aspects of the scenario that I painted. On the other hand, she helped me move to Boston and then orchestrated my return when the experiment failed. She gave me hope when I felt most desolate and courage when I felt afraid. She made mistakes without question; but her most tragic errors flowed from the time in which she lived -- a Catholic convert, she did not believe in divorce and stayed with my father despite his monumental failures and the terrible price those failures extracted from all of us. I see my mother in my strengths and my weaknesses. I have difficulty delegating, and I know my inability to trust others comes in part from her example. But my generous heart comes straight from my mother. I don't know if the ways in which I am like my mother come from nature, or nurture, or both. I'll take the bad because I could not exist without the good that she gave me. I might walk a lonely path at times, but the sureness of my tread comes from her and makes the journey worthwhile. I think of my mother nearly every day. She's now been dead for half my life. She drew her last breath fourteen days before my thirtieth birthday and twenty days before her fifty-ninth. I am older than she ever got to be but not one wit wiser nor, truth be told, nearly as kind. Whatever she was, or wasn't; whatever she did or did not do, my mother loved her children without reservation and in that, I hope that I have followed her teaching. She also taught her children to think for ourselves. She encouraged dialogue, provided information, nurtured curiosity, and rewarded achievement. I felt loved; I felt cherished; and even though we all knew that my brother Mark was her favorite, each of us felt we might just be close seconds. I thought about dredging up a cute story, or a touching moment to describe, but the memories crowded too closely. I felt to pick any one of them might leave some important tidbit behind and give only a partial picture of the woman who gave birth to me. Her character seems so complex in retrospect that no one account could possibly do her justice. My mother raised eight children despite having an alcoholic abusive husband who did not work and sometimes stumbled home cut, bruised, and ragged but other times came home with pockets full of money, new suits, and diamond rings. She found money to feed us even though working for a dollar an hour at a department store before finding a job at St. Louis County Hospital. She learned to drive at forty-two and let her husband's brother prepare a legal separation so that my dad's small trust fund could come to her, even though she felt disloyal doing it. No matter what happened, she found a way to give us Christmas and birthday presents. I am sure both her parents and my father's mother helped more than I will ever know, but my mother made things happen day to day. We were not wealthy nor even solidly middle class. Every one of us started working in high school but frankly, that did not hurt us at all. I remember my brother Kevin buying groceries for the household with his tips from Steak n Shake. His face shone with pride that he could help Mom. I've never forgotten that radiant gleam. My son told me not too long ago that a blog is a way of answering questions no one has asked at a time that no one wants to hear the answers. I daresay he is correct. These musings started out, seven years ago, as amusing accounts of past events sent to my lawyer's list serve. One listserve member called them "fluff pieces". I did not take that as an insult. Everybody needs a soft place to land. But today I have no fluff for you, no quaint recollection of a time with my mother. I just wanted to talk about her for a few minutes, and to tell you how much I miss her. If your mother still lives, please, won't you call her tomorrow and tell her how much you love her? Better still, why wait? Call her today. After all, Mother's Day is just a Hallmark Holiday. Nothing says you have to limit yourself to one day of the year to honor your mother. And you never know -- tomorrow might be too late. The week before Mother's Day: I find myself thinking about my mother, who died thirty years ago. Half my lifetime. My son never met her -- never saw the milder version of my brash self -- the twinkle in her eyes which burns in mine, the spring in her step which causes me to stumble. A month ago, I got a text from my son that said, "Today's not Mother's Day, is it?" I had to laugh. In the next week's mail, he sent me a document that I needed and on it he had placed a post-it note which read, in his right-brainer's script, Happy Early Mother's Day! I have it still. It's accolade enough. When Patrick was very small, no one took him shopping for my birthday, Mother's Day or Christmas. My sister Joyce would send presents labeled "To Mommy from Patrick", and inside would be little flowered plaques or candles. Things that a big sister picks for her baby sister. I appreciated them, and truth be told, I'd rather give than receive. But Patrick was nearing kindergarten before anyone facilitated his procurement of something for him to give me, and that was a total stranger. . . The cold concrete of Brookside bore our feet in and out of shops, the week before Christmas in 1995. I had two or three gifts left to buy, and searched for just the right thing but at a budget-friendly cost. Patrick compliantly followed me into a dress shop where I hoped to find a scarf for my friend Katrina. The owner bent over to pat his blond curls. "Such a dear little boy," she exclaimed. Patrick never grew accustomed to this attention and shrank a bit, but not enough to discourage her attention. I stood nearby, holding a blouse that I thought Katrina might wear. I checked the price, then put it back, moving over to a sale rack. Patrick stayed with the lady, a polite boy who would not interrupt her animated engagement of him. Then I heard her say, "What are you giving Mommy for Christmas, sweetie?" I wondered what he would reply. He had no experience with children giving presents to their parents other than dandelions or pictures to hang on the refrigerator. His voice: "I'm too little to go shopping by myself." My heart spasmed. The lady smiled at him and asked if his Daddy could take him shopping before I could stop her. I heard my son murmur something about not having a Daddy and moved towards them as the lady sighed. She looked at me and apologized. I shook my head, and started to reach for Patrick's hand. Then the shop-owner asked me if I would trust her with my son for a few minutes. "Would you let me 'take' him shopping? ", she asked. "You could just step outside, wait on the sidewalk, what do you say?" I had been in the shop a few times, and knew her name but nothing else about her. I saw kindness in her eyes, though, and a bright eagerness rising on Patrick's face. I took a chance. I paced back and forth in front of the place, watching through the windows. I did not feel the deepening cold nor discern the snow which started during my vigil. I saw Patrick moving around the large room, reaching his hand, holding back until the woman spoke or gestured. Then they disappeared for what seemed an eternity before they emerged from the back room, Patrick holding a box. The lady motioned to me. I opened the door and stepped inside. "We're all done!" The lady's voice reached me as I crossed to the counter. Patrick looked radiant. He held the package against his small chest and told me that it was a surprise, that I couldn't see it, that he had wrapped it ALL BY HIMSELF on a big table with REALLY BIG scissors. I looked at the woman, whose face mirrored the glee on my son's small countenance. "How much do I owe you?" I asked her. "Not a thing," she replied. "Your son and I settled the bill." I felt my heart clench again. I walked over to the blouse that I had wanted to buy for Katrina, and took it off the circular rack. "I want to get this for my best friend," I told the shopkeeper. "What do you think, Patrick? Would Katrina like this?" Patrick studied the blouse for a long minute before replying. "That's nice, Mommy, but it's not as nice as what I bought for you." And he smiled so wide that I thought the room itself would burst. On Christmas morning, I gently took the tape from the present which Patrick solemnly extracted from the pile of things from Santa beneath tree. He stood eagerly beside me while I lifted a beautiful green knitted scarf with matching gloves from the package. "It's your favorite color," Patrick said. "The lady said I could pick whatever I wanted, and I got you those! Because you're always so cold, Mommy." I wrapped the scarf around my neck and donned the gloves. We sat, smiling, his stack of gifts forgotten, joy filling both of our souls to the very core. I wore the scarf set all winter and indeed, it kept me very warm. 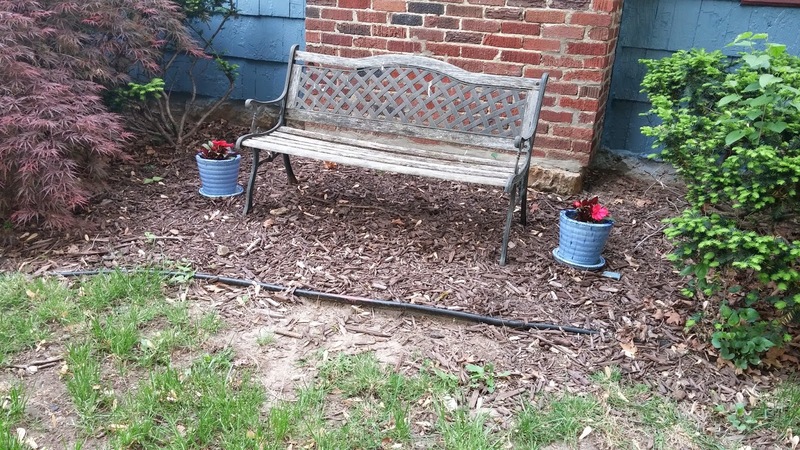 The following spring, my neighbor Tacy Rockwood took Patrick to buy a park-bench kit to give me for Mother's Day. They assembled the bench in my driveway, with me watching, on Mother's Day morning. Patrick sat on the cracked asphalt, working the little Allen wrench, teeth gritted, grunting, while Tacy held the iron sides and wooden seat-slats in place. When they had finished, I took the first turn sitting in the beautiful bench. We placed it under the cedar tree and stood back to admire it. "Happy Mother's Day!" my son exclaimed. "Now you can sit out here and drink your coffee!" I looked at Tacy, and saw again that perfect reflection of the child's happiness. And I thought of the shopkeeper, who had given my son this same gift: The gift of giving. I still have the scarf, although the gloves have long since disintegrated. And a few weeks ago, my neighbor Brenda rescued the ailing bench from the patch of ground on which it has sat for the last nineteen years, out-living the old cedar tree, forlorn, neglected, over-grown with wild onions. She carried it to the front yard and set it in a large patch of ground where there once stood an evergreen. The shrub succumbed to the drought three years ago. Though there had been talk of replacing it, that never happened. It finally occurred to me that I had the perfect thing to fill it. My Mother's Day gift, from my son.